For natural charms it is in a class by itself. Beautiful lakes, high altitudes, cool breezes. And the fishing is great! 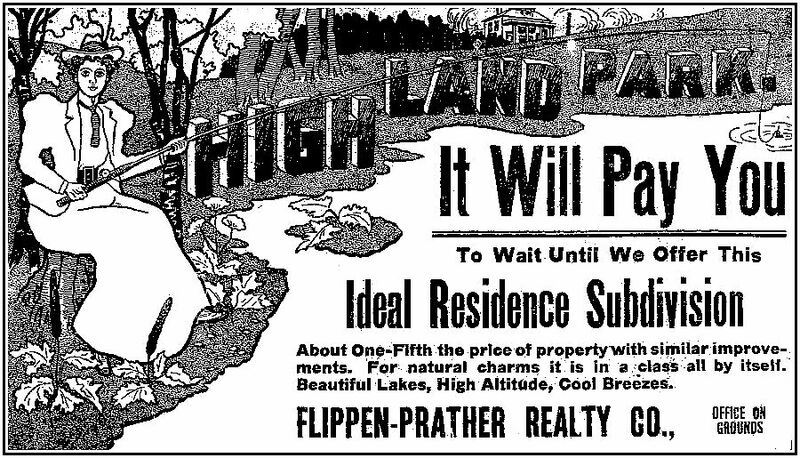 Ad from The Dallas Morning News, July 21, 1907. Altitude as an area of exaggeration or outright misrepresentation in the sale of real estate isn’t what it used to be in the days before air conditioning. In the 1940 Texas Writers’ Project guide to the state of Texas it is stated the elevation of Austin was 650 feet above sea level. The post office at 6th Street and Lavaca was in fact 503 feet, and the main building of the University of Texas 606. Perhaps in the far northwest part of the incorporated city there were heights of 650 feet, populated mostly, I’d guess, by cedar trees and goats. By contrast the 1940 guide gives the Dallas elevation as a plausible-sounding 512 feet. When I was growing up, my parents always said that we were living in a part of town with the highest elevation, and they were right. The intersection of Mockingbird and Greenville is pretty high (for Dallas). I looked into this several years ago, but have only spotty notes. As I recall, the area around SMU was about the same if not slightly higher. So this ad is actually correct — although using the mountainous-sounding “altitude” is a bit misleading! An online reference seems (to this non surveyor) to state a benchmark on top of the reservoir at Greenville and Mockingbird indicates an elevation of 630.73 feet. I think the presence of the reservoir suggests this is at least a locally significant high elevation. Google Earth says the elevation of the center of the reservoir is 632 feet. The Mockingbird-Greenville intersection is 618 feet. Back around 1960, the reservoir wasn’t fenced, and neither Matilda Bridge street nor the pavement and pump stuff on the north side was there. We used to slide down the northeast corner of the reservoir on cardboard. After the grass had died in the fall, it made an amazingly low-friction surface. My other idea of fun was to ride my bike from our (north) end of Matilda up to Mockingbird, then do a high-speed downhill run back to the north end. According to Google Earth, it’s about a 14 foot difference. My major recollection of the reservoir is that it’s where I first saw grackles in all their weird glory. This was about 1957 or ’58; an online time versus range map pretty much confirms their arrival in north Texas in that period. We just called it “the water storage tank” when I was growing up on Matilda St. in the 1950s and 60s. I don’t think I knew it was the Turner Reservoir until the Internet age. The reservoir, the open area north of it, and the MKT railroad north of that (now a DART line) were my main roaming areas. Mockingbird and Greenville may be the highest elevation in Dallas proper, but the highest elevation in Dallas County is Cedar Mountain (a little west of the town of Cedar Hill), which is now a nature preserve. Southwest Dallas County in general is about a hundred feet higher than the highest elevation in North Dallas.